So I bought a new desktop PC off Woot.com back in October. It was a HP desktop suitable enough for my needs. I didn't like that it came with Window 8 but also recognized that is the leading-edge OS in the Windows world and I might as well join the avant-garde party. I could have got a Windows 7 if I had jumped on one quickly enough but by the time I ran it past my fellow geeks the option that gave me the best hardware for cheapest price was gone. All in all, I'm quite happy with the $400 savings on this one then the custom one I might have built on the HP website. 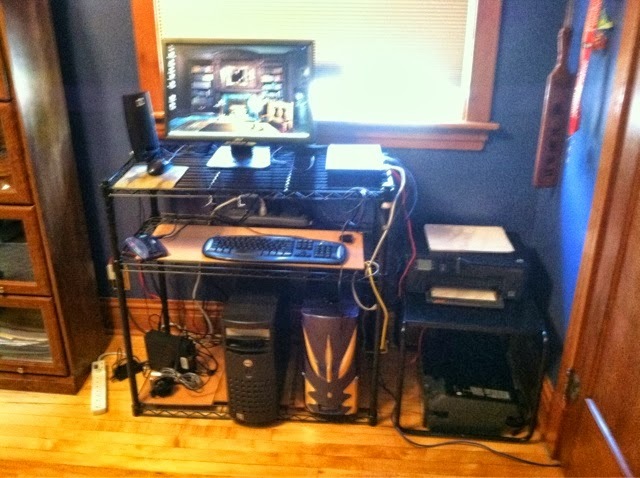 Before this new PC arrived, I had three desktop PCs that I used for the following purposes. My main desktop, a dell PowerEdge 400SC class PC which I got for $20 at a yard sale in 2009. I got it to replace the dinosaur Dell (named Orion) that I had been using since 1999. I threw a copy of XP on it and added the data drive from Orion. I really only used it for storing emails, some web surfing and blogging. PC that I built in 2007 that was supposed to be an Application Server but I changed jobs and it ended up really being just a glorified storage drive. I had plans to use it as a NAS but never got around to it. When Nightingale and I merged households, one of my many time wasting tasks was going through a box of 3.5 inch diskettes and seeing if there was anything of value worth saving. A few got copied to this machines hard drive. Alas, somewhere between all the moves, the HD got fried and it won't even spin so I've lost whatever was on it. I do have redundant copies of most of it, but there's always a chance one file was missed over. You know, the one with the next great American novel on it, about a vampire who loves a zombie and they go to wizard school or something like that. malware, spyware and other junk off it and convert it into a clean poor man's Roku that we used at the condo so we could watch a few things online since we didn't have cable. Anyway, when they were all working they were fine machines and I had geek-visions of re-purposing the machines as media storage, surveillance camera servers, firewall and whatnot. Alas, it's too much work and we aren't there yet. Hence the new PC -- this is probably the last traditional desktop I will ever buy because the leading-edge trend is to go tablet. On the new HP, I just have my current email on Outlook 2013 -- I was fortunate to be able to purchase Office 2013 for $10 as an additional benefit of my current employer and the fact that Micosoft is ready to move on to Office 365. I figure another month or so and I will be confident that I can drop these machines -- stripped of their hard drives of course -- off at the recycle center. I figure if I don't come across it in a month, I won't likely need it at all. Yes, I do have a a backup of the HD on an external Maxtor drive, but I'm not convinced everything got copied. The problem is that I'm using a maxtor that is already very full with other backups so I cannot simply select the copy the entire drive option and for some reason I cannot select or even see certain folders. I could trouble shoot it but I rally don't want to invest that much effort and energy. Thank you for reading and I hope you will comment below. Here's the part where I beg for stuff because we get paid in likes, shares, re-tweets and feedback. Please also do any and all of the following: Follow Mysteries of Life on Twitter (@MysteriesOLife), Facebook or subscribe via email.